As we walked over to the Convention Center, I happened to see the Purely Decadent truck parked on a side street and had to run do a happy dance in the street... (Scoops of ice cream bigger than my head... I'm in heaven...). Once inside the Festival, we wandered up and down aisle after aisle, sampling all sorts of interesting and tasty items. Talk about sensory overload. Wow. They had generous samples, helpful information and were SO friendly! We jut stood there chatting and trying ALL their yummy items. I am always raving about the stuff to people and getting soy-skeptical omni friends to try it - one time I randomly started talking about it to someone in the grocery store... I should do their PR, I swear! (They're a small artisan company based right here in Seattle, so it's even LOCAL!) it was fun to try everything! If you have access to them in your area, DEFINITELY check it out - the sausages especially? Amazing. 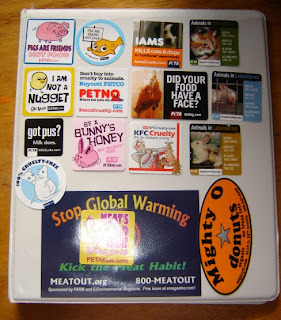 My friend's husband, a devout omni :) even gave them his seal of approval! So of course we had to ham it up (can vegans do that?) a little in front of their sign. Oh, and one of the staff even recognised me - which was sorta cool; "Hey, you're the Blog Lady" she said. Funny. Yeah, they have a nice little blog here that I'd posted a comment in a while back. My friends called me "The Celebrity Blog Lady" for the rest of the day - :rolling eyes: great! Other interesting items; samples of Purely Decadent "brand new" flavors they're introducing this summer; Pomegranate-Chip which was just OK, a Coconut Crunch sorta-thing which was too coconutty for me, Strawberry-something which I can't remember the name but we all really liked, and Orange-Creamsicle and Lemon Creamsicle which we agreed were heavenly! Speakers included nutritionists, chefs and dietitians. The featured presenter while we were there, was doing a presentation on ways to use nuts. She had good ideas, some of which I already use and others I hadn't thought of, but unfortunately was very soft spoken and it was hard to hear. There were pretty long lines for some of the more popular samples and sales pitches, so it took us a while to make the rounds, but all-in-all, a really fun and interesting afternoon. On the hike back to the parking garage we passed the Purely Decadent truck again... and even with tired feet - more happy dances in the pouring (Seattle) rain... yeah, we're weird. Great ending to a great day! After returning home, I dumped my bag out and took a picture of all the great take-home samples we returned with as well... I had no idea there was so much until I put it all together - and we didn't even hit every booth! I feel like I hit the veggie-sample jackpot all over again. I love this post! 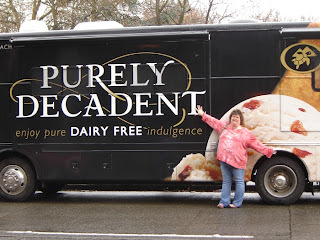 First of all, the picture of you in front of the Purely Decadent truck, I'm right there with you!! 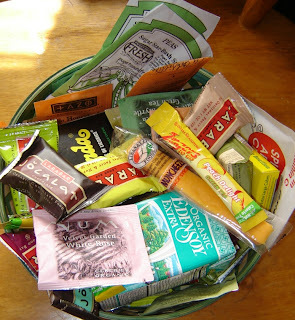 I went to a health fest here in Syracuse today, and brought home a stash much like yours. I'll post about it sometime soon. Aren't events like this so fun, trying new things, samples, meeting cool new people, and... oh yeah, soy ice cream... mmm! How fun! I wish we would have a big veggie convention here. Field roasts are fantastic. We had one during the holidays. We got ours at Whole Foods. There is a picture on my post for those who wonder what it looks like. Sound like a blast! Way to go with the goodies and stickers! oh you are sooo lucky! I wish they had something like that here! Absolutely awesome post! I am so jealous of what you people in Seatle have access to, it's like you are vegan capitol of the world. :) Your day looks like it was tons of fun. We used to have a time in which my buying club would offer members a day of samples and great food like yours, but it sold out to a corporation two years ago and now no longer host shows like this. What a great family, I love dancing in the rain too. I'm seriously jealous!!! Access to a whole festival with veg stuff -- I can't even find a restaurant in my town that can make a decent veg meal (lol). Well, at least I can experience it through you. What a great post! I love the photos you've done and you all look like you are so much fun to be around!! 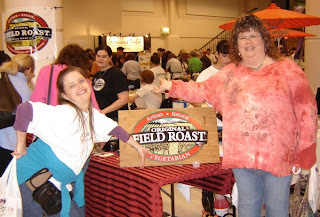 I went to the Seattle Vegfest last year as a fairly new vegan and loved all that I learned! I see you had a good time and got lots of loot!! This has me interested: hemp milk! Wow! That sounds so different! How fun! I love the photo of you with the big ol' scoop o'"ice cream." That's a shot they should use for an advertisent. And just in general, that convention must have been INSANE! Count me as very envious that i wasn't there, but i'm stoked you WERE. Thanx for sharing the fun and festivities!